Truly, a profound moment. A profound experience. Yesterday, it was such a privilege for me to celebrate Iris and Jill’s loving relationship of more than 20 years with a high personalized, romantic and family oriented wedding ceremony. 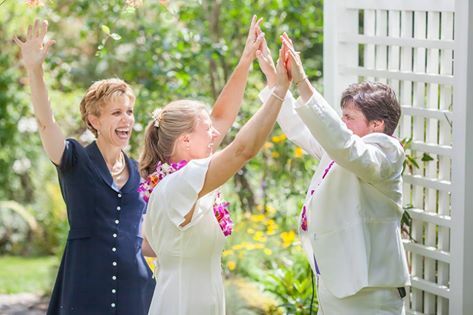 Married August 10, 2013 in their gorgeous garden at their home in Ravenswood, and surrounded by 100+ delighted family and friends, Jill and Iris truly “rocked it” with a profound celebration of the roads, twists and joys of two decades of loving partnership. We had a wedding tree. We had river rocks with personalized messages. We had a group video moment for Grandma Millie. There were vows taken from words exchanged years ago in a commitment ceremony in Hawaii. We had fragrant and beautiful flower leis. Oh, and don’t get me started on the bodacious tent, fabulous sound system and amazing spread of food and drink – these women know how to host an amazing party at home! Jill and Iris: I am the lucky one to have been a part of your lifetime moment yesterday. From my heart to yours, thank you.